“Be someone or do something worth talking about in wedding photography” - this is my take on Benjamin Franklin’s famous quote. In a day and age when there are so many photographers out there and the market is completely saturated, it can be difficult to stand out. It used to be easy to just have the best gear and be a great wedding photographer to get clients. But today, you need to do much more. The truth is, people really care about how you make them feel and what benefits you’ll bring to them. So in this podcast episode, I want to focus on finding ways you can make a difference, bring value to others and do something that’s memorable in other people’s minds. If you’re just starting out as a second photographer, are you dependable and reliable? Or if you’re running your own wedding photography business, what are you doing that’s making a difference in the lives of your clients, other wedding photography vendors….even other wedding photographers? 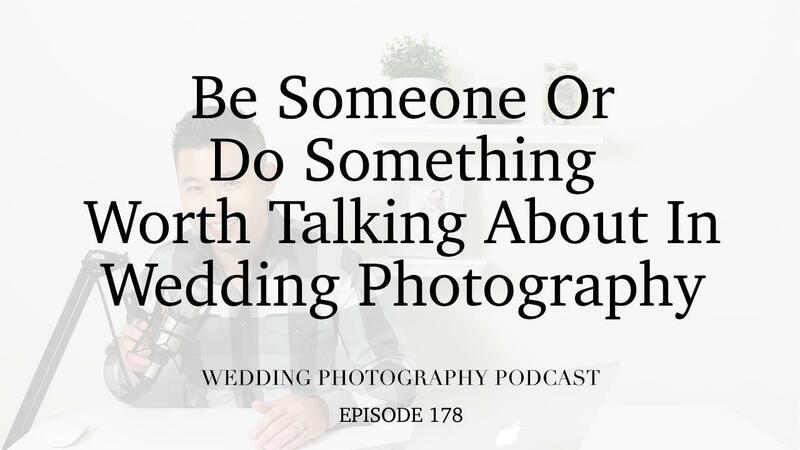 We’ll chat about what you can do outside of the box to make you stand out from the competition and be a wedding photographer that’s worth talking about.